……all anyone’s talking about is there may or may not be gold-plated toilets in the place. And you wonder why the death-spiral is tightening and speeding up. Updated 7 June 2015, 1340 Hours. Please scroll through – Original posting remains as-is. (AP / The Times Of Israel) — Turkey’s president has invited the country’s main opposition leader to inspect the lavatories in his lavish palace, insisting he won’t find any gold-plated toilet seats. Turkey holds general elections on Sunday. (Ed. Note: That’s tomorrow, 7 June 2015.) Recep Tayyip Erdogan is not running but has been campaigning on behalf of the ruling party — which he headed for more than a decade. He hopes it can get a large enough majority to change the constitution and replace Turkey’s parliamentary political system with a presidential system with a powerful head of state. But the big stink overriding everything is throne sittin’. Kemal Kilicdaroglu has refused to set foot in Erdogan’s palace — which his and other opposition parties and some non-governmental organizations say was constructed on protected land despite court rulings — and has boycotted events there since it was inaugurated last year. The vast complex in Ankara was built on farm and forest land that was once the property of modern Turkey’s founder Mustafa Kemal Ataturk, and has been dubbed “the illegal palace” by critics. “A president who respects the rule of law and court decisions would not live in an illegal place”, said Gursel Tekin, secretary-general of Kilicdaroglu’s Republican People’s Party. Wait…… Hold it…… “A president who respects the rule of law and court decisions would n……“. Oh. Sorry. My bad. For a second there I thought the article started talking about President For Life Barack Hussein ‘El Guapo’ Obama (PBUH). Still though, does anyone really expect typical MooseLimbQuranimal Recep Tayyip ‘Horse Nuts’ Erdogan to actually give a rat’s chocolate starfish about any law or court ruling not adhering to Shari’a or the typical Muslim agenda ? Anyway, this whole thing is really starting to take a dump on the Turkish elections. Erdogan told state-run TRT television in an interview that he would resign if Kilicdaroglu found a gold-plated toilet seat at the $620 million palace. The interview was conducted in a palace room decorated with gold-colored furniture. Mrs. S. drove them home and the entire way, Mr. S. was rambling on about the amazing gold toilet at the Parker’s house. You better watch out or the insects will get you ! Ankara, Turkey, AP via The Times Of Israel — Turkey’s president, Recep Tayyip Erdogan, has defended the controversial construction of a grandiose new presidential palace, saying his old office was infested with cockroaches. Can’t think of a better reason to spend $620 MILLION FOR AN 1,150 ROOM ‘COTTAGE’. Horse Nuts must really love his nation’s Prime Minister because – roaches and all – the old place is now the official PM’s residence. 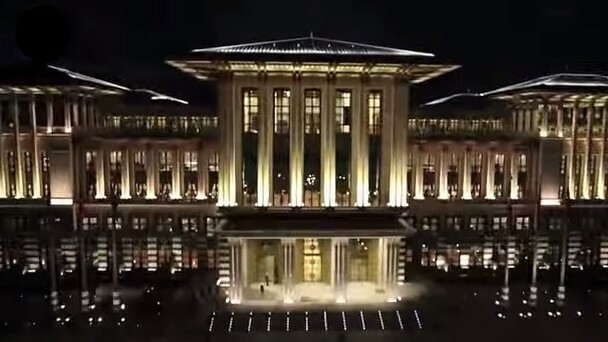 Erdogan moved into the vast structure after he was elected president in August. The former presidential palace was given to the prime minister. In a television interview late Friday, Erdogan said cockroaches had roamed the lavatories in the now-vacated prime ministry. You simply can’t make up this kind of gubmint nonsense. This entry was posted on Saturday, June 6th, 2015 at 08:22 and is filed under Just For The Fun Of It, The Media. You can follow any responses to this entry through the RSS 2.0 feed. You can skip to the end and leave a response. Pinging is currently not allowed. Erdogan seems himself as the new Sultan Mahmood, head of the New Ottoman Empire, so yeah Gold Toilet Seats would fit in with the Decor. I guess he won’t want to play the tuba again. Money goes to money they say, but it dozen’t necessarily bring your happiness. It helps to pay the bills and get you some luxuries in this life, but for real happiness you need to cultivate self contentment and self discipline. What’s wrong with the old zinc toilet bowls ? With all that money, they couldn’t buy a couple of cans of Raid?